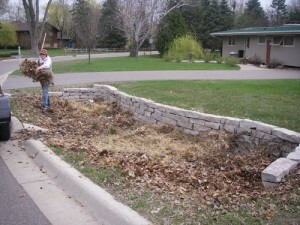 Natural Shore’s experienced maintenance staff has teamed up with Metro Cities and private home owners to make sure their raingardens remain beautiful as well as stay functional and efficient. To the casual observer these picturesque gardens might look like just another lovely patch of flowers, when in reality they are a functioning stormwater utility much like a pipe or a stormwater pond. As with any infrastructure maintenance and care is always needed to preserve proper function and integrity. Through years of refining our raingarden maintenance program we have come up with a model to ensure our clients are getting the best out of all these beautiful and functional gardens. 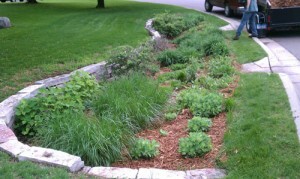 Raingarden in the spring before cleanup. Early in the cold months of winter while the raingardens are asleep blanketed in a thick layer of snow, Natural Shore staff meet with clients to develop the best strategies for the upcoming season to keep these systems properly functioning and alive with color and texture. Once the icy grip of the Minnesota winter begins to thaw and the first signs of green life begin to push through the newly warmed soil, maintenance field crews begin their work. 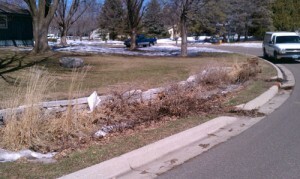 Spring cleanup is an important component to any raingarden maintenance program. Each spring, vegetation cover that was left in the raingarden from the previous season is cut down and removed to make way for this year’s growth to emerge and flourish. Sediments that have accumulated over the last year, as the raingarden performed its filtering duties, are also removed giving the garden a renewed spirit. Adding a new fresh layer of hardwood mulch to a raingarden will help control weeds, hold moisture and give a neat appearance. A fresh layer of hardwood mulch not only makes the raingarden look purposeful and manicured but it helps in weed control and moisture retention. 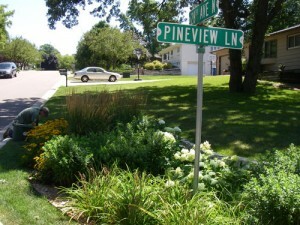 Special care and attention is given to each garden depending on site and client preferences. Want a change? This is the best time to add new color or replace struggling plants with something better suited for specific conditions. Monthly care throughout the summer will ensure that all unwanted weeds are removed, keeping the formal garden like appearance looking beautiful and the garden functional. 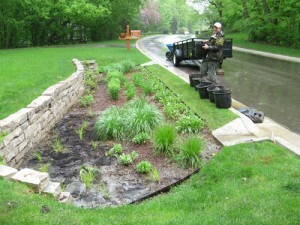 For more information on Natural Shore’s rain garden maintenance program call or email us and we would be happy to evaluate your maintenance needs.